Finding and debugging the top 5 errors in Scratch programs: There are several errors that new Scratchers tend to make. If you're on the look-out for them, it'll make it easier to fix your programs, and to guide students in fixing their own. What's the difference between a variable made for one sprite and a variable made for all sprites in Scratch? : This issue is particularly important because it's so hard to untangle if a mistake is made. I've created a short demo that should help to make the difference clearer. Feel free to use it in your clubs and classrooms! You can still find my 10 Block Scratch Demos here, and lots more resources on my minisite for my book Scratch Programming in Easy Steps. Blood Swept Lands and Seas of Red is an installation at the Tower of London to commemorate the 100th anniversary of the First World War. It fills the moat of the Tower with 888,246 ceramic poppies, each of which represents a British military death in the war. Last week, I was pleased to be able to spend the morning as one of the volunteers assembling and planting the poppies in the moat. The installation is a beautiful tribute to the lives lost during the war, and a powerful act of remembrance. It was touching to see mementoes left by members of the public in memory of relatives they had lost in the war, but probably never known. As I walked around the Tower after my shift, I spoke to a few members of the public who asked me questions about it, and I had a sense that many people were moved by the installation. 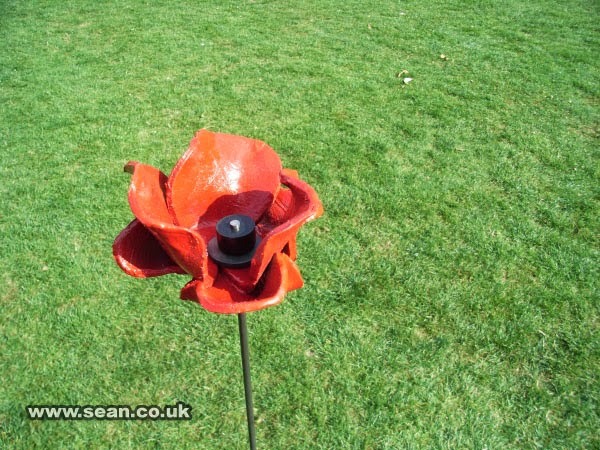 The last poppy will be planted on 11 November, and the installation will then be gradually disassembled. You can buy one of the poppies, with proceeds being divided among six service charities. Here are some photos I took on the day. By showing the poppies up close, I hope it helps to give a sense of scale to the installation. 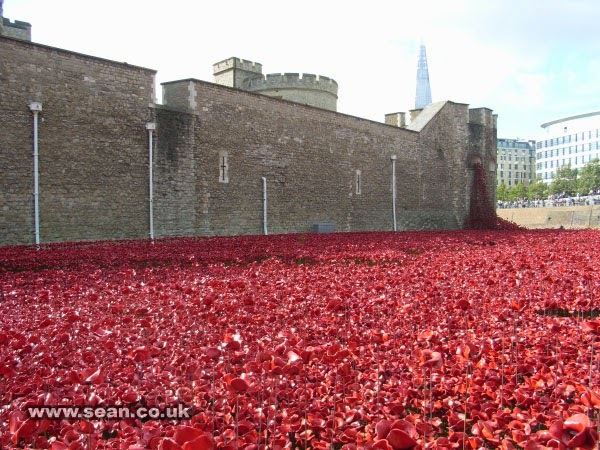 It looks spectacular from the walkway around the tower, but getting up close really brings home just how many poppies there are, and how many people it represents. A single poppy. Each one is hand-crafted by ceramic artists, working around the clock in three shifts. Assembling the poppies was quite hard. In our four hour shift, we were aiming to assemble and plant 50 each, but I think we probably managed closer to 30 in my group. A cluster of poppies. 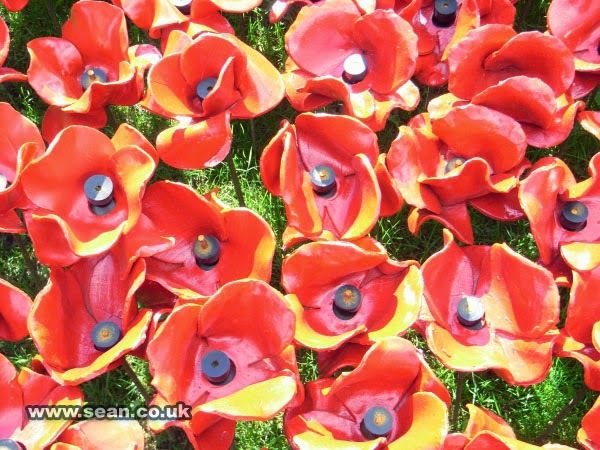 You can see more clearly here how the poppies differ. I hadn't seen the installation before my volunteering shift. 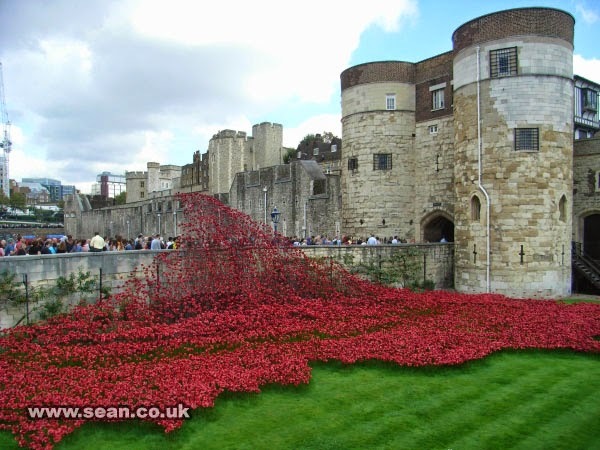 We approached it from the Tower Bridge side, where the sea of poppies isn't as wide. 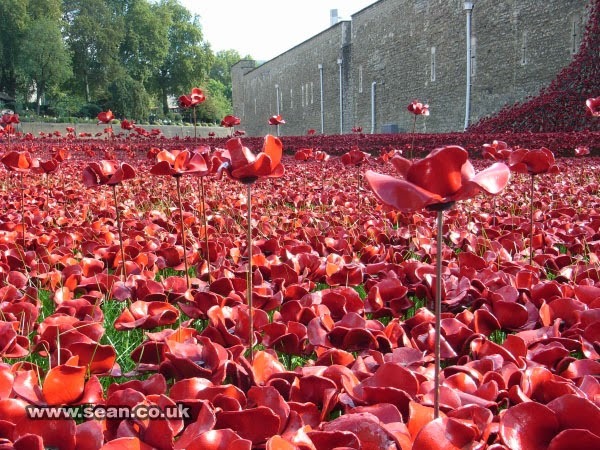 It was sobering to think that each poppy represents a soldier or other military employee. And then, when you turn the corner: the sea of red, almost filling the moat, and really bringing home the horror of how many lives were lost. To add texture to the landscape of poppies, some have taller stems than the majority. The poppies appear to cascade down the side of the tower, and here come crashing over the bridge that provides visitor access to the tower. 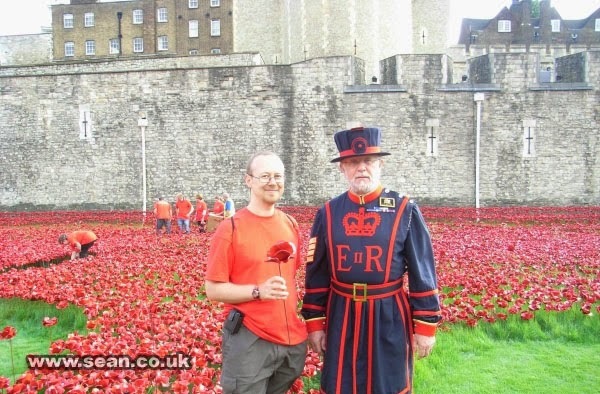 A photo of me (left, obviously) with one of the Yeoman Guarders at the Tower of London. It was a wonderful experience to contribute to this unique installation, which draws upon poppies designed by Paul Cummins, a setting by stage designer Tom Piper, and contributions from thousands of staff and volunteers. Thank you to the Tower of London and the team behind this project for giving me the opportunity to be part of it, and for looking after us all on the day. You can see my photos from Dernancourt War Cemetery in the Somme, France here, and my photo from the Big IF art installation in Hyde Park here.